Located about 30 minutes east of Colorado Springs is an area known as the Paint Mines. Once private land, El Paso County purchased the land a few years ago and made it into a park. The Paint Mines is so-called because many years ago, Indians used the colorful sandstone and clay for pottery. In the 1800's, a company manufactured bricks from the clay and transported them by wagon to the market places. The park is just southeast of Calhan, Colorado and has two parking lots and entrances where long trails will take you down into a depression and canyon area where large hoodoo rocks colored in shades of yellow, pink, red, and white loom in mushroom like formations. This image was taken in an area still on private land today, and is call Twin Rocks. I received permission to photograph in the area from the then head of the county parks department. The camera used was a Bronica ETRS 645. I've long been a fan of Celine Dion. Probably my favorite song that she does is "The Colour of My Love". It was written by David Foster, who has written other songs for Celine and for many other great performers, such as Josh Groban. This song is a favorite selection for weddings. Celine performs the song here. COMMENT: It's hard to be a photographer and not have many photos of hot air balloons if you live in Colorado Springs. Every year, balloonists converge at Memorial park for the Labor Day weekend and we are blessed with about 60 to 80 balloons lifting into the sky early in the morning. Since hot air balloons are at the mercy of the air currents which are effected by the climate each day, it's a good day for all when they actually are able to fly. Too much wind can cancel the event . Needless to say, it's a delight to see these huge, heat driven globes lift one by one. Children and adults alike are seen walking around with frozen smiles on their faces with so much to see at one time and everywhere the sounds of propane burners inflating the balloons. 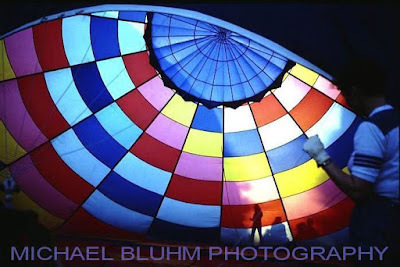 I thought the above balloon was particularly beautiful and decided to get an inside view as it was being inflated. The image offers an almost cathedral-like look with checkered colors similar to that of a stained glass window. Notice also the shadowed image of a woman crew member providing tension on a guide rope.